1. Will the Muppet soundtracks ever be released again on CD? The Muppet CD's have been out of print since 1993, and even then very few copies were available. That's why it often costs more than a $100 to get those rare CD's like The Muppet Movie on auction sites such as eBay. Henson has had a lot of trouble getting a record deal the past few years and that's why those discs are so tough to get. A new Muppet anniversary CD has been released which includes tracks from the Muppets six feature films and the Muppet Show. You can order this 27-track greatest hits collection here. You can also hear all of the Muppet soundtracks on Muppet Central Radio. 2. How do I find my favorite Muppet collectible? Our online shop includes the latest Muppet merchandise and a variety of fan collectibles for sale. Every time you purchase an item it helps to ensure that our work here continues. It does take a lot of time (from many people) and money (out of our pockets) to make this site come together, so please support us through these avenues when possible. Thank you. If you have a question about Muppet collectibles, please post it on our discussion forum. This forum is designed to provide an easy resource for answering everyone's questions. 3. 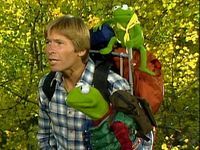 Where can I find my favorite Henson show or special on video? Our shop has available all of the current Henson videos and DVD's that are in print. Check there first for the particular title that you are seeking. From 2000-2002, Time-Life Video released a series of Muppet Show DVD's and videos. These include unedited episodes of The Muppet Show released for the first time, including hilarious skits that were never seen in the US. 4. How do I trade or sell an item? You can sell or trade any Muppet item on our fan collectibles page. We'll list your item for free and an interested buyer will contact you via e-mail in order to complete the purchase. Please let us know when the item sells so that we can take down your listing in a prompt manner. 5. 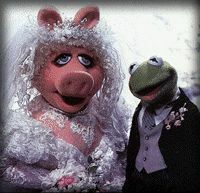 Where can I find a Kermit and Piggy cake topper for my wedding? Unfortunately, an officially licensed Kermit and Piggy cake topper does not exist. However, as this question has been raised many times, we've seen a lot of clever solutions. Music boxes, PVC's, and Pez dispensers are just a few examples of what can be turned into a cake topper by painting a gown white or making a tiny veil. 6. What is a PVC and how many exist? PVC is a term that is used to describe a small plastic figure. PVC actually stands for polyvinyl chloride. This is the same material that is used to make plumbing pipes. Hundreds of Muppet PVC's have been made throughout the years and some are quite rare and highly collectible. 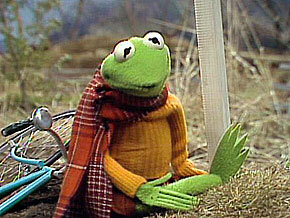 Check out our collectibles section for more Muppet PVC's. 7. 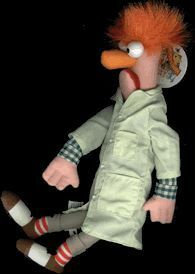 Where can I get the Muppet Vision dolls, like Beaker or Statler and Waldorf? Here is a list of the dolls available as of 2002. Each doll includes it's order number that you'll need if purchasing directly from Disney. They can be ordered by calling Walt Disney Mail Order in Florida, 407-363 6200. These dolls can be shipped internationally. You can also find them on-line at Mouse Shoppe by searching for "Muppet". If a doll is out-of-stock, try eBay. 8. Where can I get Muppet movie DVD's? DVD's of The Muppet Show, the Muppets six feature films, The Dark Crystal, Labyrinth, Bear in the Big Blue House, Farscape, and several Sesame Street releases are all available in our on-line shop. If you'd like to know the latest news about DVD releases be sure to sign up for our mailing list. 9. What scenes are missing from the Muppet Family Christmas video? Muppet Family Christmas has been released on video in both 1994 and 1998. The acclaimed special arrived on DVD in 2001. However, every commercially available version in the United States and Canada has scenes edited out. Why has this beautiful special literally been chopped up with every video release? Well, apparently when Henson secured the music rights to all the songs performed when this special originally debuted on television on ABC in December 1987, only the full rights to the songs were secured for television. Meaning the special can air complete and unedited even to this day on TV if the station airing it so chooses. YTV in Canada and also the Hallmark Channel in the US have shown this special in recent years, both with very few edits in comparison to the butchered video releases. Because the US song rights are different for other countries, the PAL video release available in Europe is reportedly complete (with the exception of Fozzie and Ma talking by their stockings at the end of the special). This special has been released to video three times in the US and Canada: 1994 by Disney, 1998 by Columbia Tri-Star, and 2001 by Columbia Tri-Star on DVD. The total running time of the video release is 42 minutes and 16 seconds (with Disney's opening logo on the 1994 version) and 42 minutes and 6 seconds (with the opening logo on Columbia's 1998 and 2001 releases). Some think that the 1994 Disney release is longer due to the running time listed on the back of the video at 47 minutes, however, this time includes the Disney promos shown at the beginning of the tape. In comparison, the original unedited special had a running time of 47 minutes and 59 seconds. The red "A Muppet Family Christmas" logo seen at the beginning was added later for the video release. In the original, the red logo is seen over Ma Bear's farmhouse at the end of the song "We Need a Little Christmas". This brief musical interlude is edited from the video releases. The snowman musical and comedy number with Fozzie is completely gone. They sing "Sleigh Ride" in the original version. Rowlf begins the song by playing "Sleigh Ride" on Emily Bear's out-of-tune piano. Rowlf says he "loves out-of-tune pianos" while Sprocket watches him play. Fozzie, the Snowman, and penguins sing outside. This is a very abrupt and obvious edit. The Muppet Babies film "Santa Claus is Coming to Town" is removed. The film begins and Animal immediately bursts through the screen. Included in the broadcast version of the film are the baby versions of Piggy, Kermit, Fozzie, Rowlf, Scooter, Fozzie, and Gonzo. This is another clear edit that something is missing. Doc comments that the film was fun when there was nothing for him to see other than a one second shot of Baby Piggy and Animal immediately bursting through the screen! 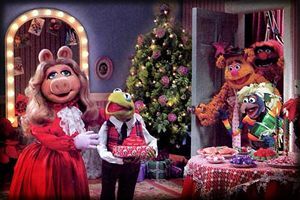 Miss Piggy and the Muppets singing "Home for the Holidays" is not shown when she arrives at the farmhouse. Miss Piggy falling on the icy patch is also removed. When Kermit mentions that Miss Piggy always likes to make an entrance, the video release cuts immediately to the beginning of the Carol Sing Medley. "Have Yourself a Merry Little Christmas" and "I Heard the Bells on Christmas Day" are edited out during the Carol Sing Medley. Emily Bear hangs Fozzie's stocking underneath the fire. Fozzie mentions that he's a grown bear alluding to the fact he doesn't need it anymore. When Emily reaches to take it down, Fozzie decides it's ok to leave it up. This entire scene is removed. This occurs right before Kermit gives Miss Piggy a mink for Christmas. Some fans ask, "Why is the stocking scene with dialogue cut when there are no musical rights issues?" A new digital TV master was made by Henson in the late eighties for reruns on ABC and later when Nickelodeon began airing the show. The new TV logo was added at the beginning and that one scene with Fozzie and Ma was cut making it immediately dissolve from the end of the Carol Sing to Kermit and Piggy talking. Time might have been a factor here as well and this was an easy place to make a slight edit. Because the new master was of higher quality and had the new logo placed at the beginning it's been used for subsequent TV airings and video releases. If you are trying to find an unedited version of this special, post that you are looking for it in the "trades" section of our discussion forum in order to arrange a trade with another fan. 10. 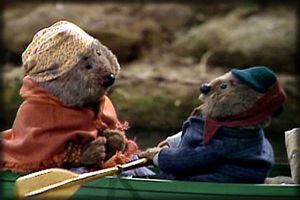 What scenes are missing from the Emmet Otter's Jug-Band Christmas video? While the severe edits to Muppet Family Christmas are due to music and lyric rights obtained only for broadcast television (in the United States and Canada), the cuts to Emmet Otter aren't as easy to explain. It's possible a different master than the original broascast version was used by Columbia in order to record their video release. They likely removed Ma's "dock falling" lines in order to make it more "politically correct". If Columbia did use a different master than the one shown on broadcast television, it's possible Kermit's appearance at the end of the special was added later as a last minute addition for the TV debut. The total running time of Columbia's 1998 video and 2001 DVD release is 50 minutes and 28 seconds. GRETCHEN: You shall. Remind me of that when I pay you, next week. Ta. MA: We-well, I've got the bill right here, and I'd really appreciate it if...you'd...fall off the dock. EMMET: (laughs) Way to go, Ma. MA: Yeah, well, sometimes you gotta talk tough to these uppity types. WILL POSSUM: Heh heh! That's telling her, Alice. MA: Oh, Will Possum! I didn't even see you there. GRETCHEN: You shall. Remind me of that when I pay you. Next week. WILL POSSUM: Hey there, Alice! In the original, right after Emmet says, "At least there ain't no hole in the washtub," Ma's line is, "Oooh, 'Ain't Got No Hole in the Washtub'! That's what you call your basic keepin' warm while you're rowin' kind of song." The video release cuts right to Ma singing. Two new lines of "Ain't No Hole in the Washtub" are inserted. During the talent show, a new act is shown right after Clarence the Dancing Horse. Two huge rabbits (nearly the size of the stage) jump up and down. Will Possum's comment to Mayor Fox is removed. Instead, Will says to himself, "Gonna be a long night," after the rabbit dance. Kermit's appearance in the Riverside Rest, watching Emmet's band perform, is removed completely. If you are trying to find an unedited version of this special, post that you are looking for it in the "trades" section of our discussion forum in order to arrange a trade with another fan. You can also read a review of the Emmet Otter's Jug-Band Christmas DVD. 11. Why was the flying scene cut from the Rocky Mountain Holiday release? In case you are wondering exactly what is missing from your DVD or video, below is the full text of this scene. It begins with John, Rowlf and Janice at the camp site. JOHN: Rowlf, was that a hiccup? JOHN: Rowlf. I cured them for you last summer. I can do it again. JANICE: You cured his hiccups last summer? With the ol' breath in the paper bag trick? ROWLF: Ok. What now? (Propeller starts spinning) Ugh. Oh boy. 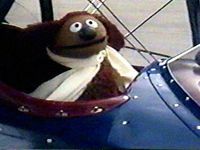 ROWLF: Dogs have bad luck in airplanes John. Haven't you heard of Amelia Airdoyle? Ugh. ROWLF: Hey John, I really don't mind having the hiccups. ROWLF: (Screams) Which way is down? ROWLF: (Groaning) John, can we double back and pick up my stomach! ROWLF: It worked again John. Just remembering that ride has cured my hiccups. JOHN: You know this is my favorite time of the evenin' gang. Sittin' around a camp fire like this. Tellin' stories, singin' songs. In fact I wrote a song exactly about this. Another scene is also slightly edited on the DVD and VHS release during the Jaws parody sequence. Rowlf is in an inner tube floating down the river, and Gonzo is approaching with only his nose above water. The musical underscore has been replaced from the original broadcast version. Originally, the music is Jaws-like with a disco beat featuring a sax melody. The DVD and video features what sounds like a slow, sneaky parody of "Sanford and Son". The music doesn't take a lot away from the scene, but it is noticeable if you are used to the original. The melody was changed due to musical rights issues. If you are trying to find an unedited version of this special, post that you are looking for it in the "trades" section of our discussion forum in order to arrange a trade with another fan. You can also read a review of the Rocky Mountain Holiday DVD.